Is that an enthralling title or what?! 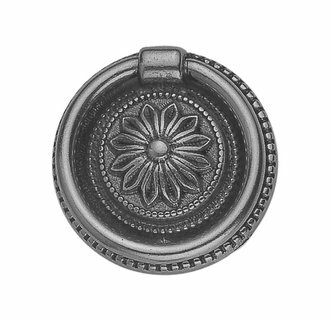 Didn't think I'd ever find myself spending hours on the internet searching for drawer pulls, but alas that is what has become of my life. Mind you, I am not complaining. There are worse (and less productive) things I could be doing on a Sunday afternoon. So why the drawer pulls, you ask? Well yesterday my boyfriend and I visited an awesome custom furniture shop in the Heights neighborhood of Houston (let me know if you want the info) that replicates wooden furniture from Restoration Hardware (and probably anywhere really) at a fraction of the cost. 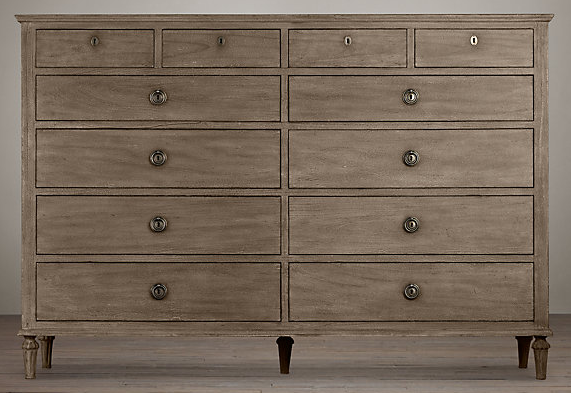 My boyfriend has chosen to have them build the Restoration Hardware St. James 11-Drawer Dresser in the Antique Coffee finish (see picture below). While this isn't the exact piece of furniture I would have chosen, I still love it and am pumped for it's arrival! Since the guy who is building it already had an unstained "floor model" on hand, it should be ready within the month. And it will be delivered fo' FREE. Double like! In case you were wondering, I was really pushing for the Maison dresser (pictured below). Love those skinny legs (feet?) and the overall "French" feel of this guy. 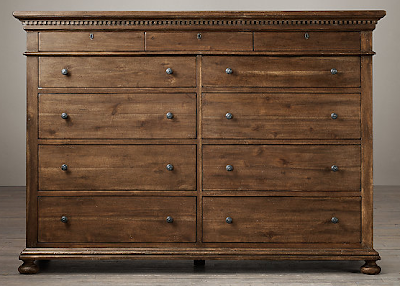 No surprise, since my Wisteria French Directoire dresser is my most favoritest piece of furniture in my apartment. However, St. James won in the end by the simple rule of: not yer money, not yer choice! Also, I will reluctantly admit that the St. James is much more masculine. Grr. Can't win 'em all. Well, I guess I can kinda win 'em all since one element of the Maison will be incorporated into the final product. Assuming you read the title of this post, you can probably guess what element that will be. Yup, the drawer pulls. 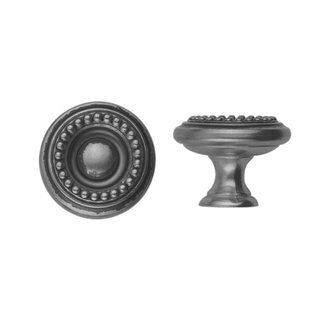 We both liked the more antique-y look of the ring pulls on the Maison vs. the knobs on the St. James. And that actually worked out just fine since it turns out the knobs/pulls are not provided by the person making the dresser. 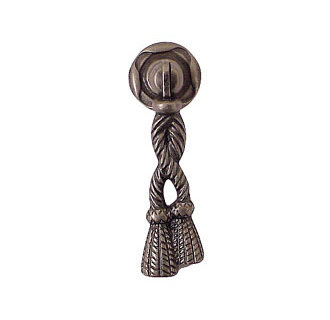 Left to fend for ourselves in the "drawer opening device" department, we hit the interwebs for some drawer pull inspiration. For some reason it was very important that the ring make a complete circle. Fine by me (even though I really like the semi-circle bail-pull-with-backplate style) since that one requirement greatly narrowed down the pool of potential applicants. This made the search process way less overwhelming. I'm currently a little torn on the size (1.5 inch vs. 2 inch give or take). Since he wants two pulls per drawer, I'm leaning towards the smaller. 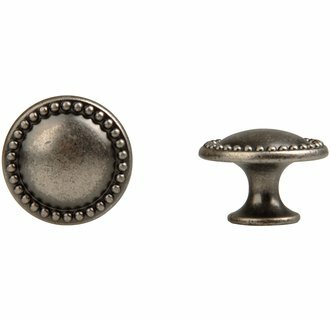 There is no way the knobs on the original St. James are more than 1.5 inches in diameter. But those drawers are large and could probably handle 2 full inches. But then that makes them more expensive. So many variables! Also, for the top three drawers he wants something different. 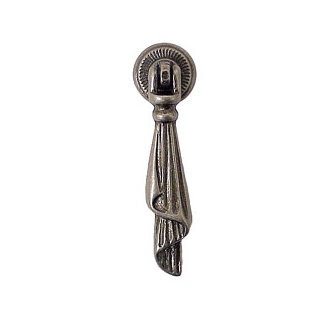 Originally we were thinking the keyhole/key combo of the original St. James, but I think this will be hard to find in a color that specifically matches/complements the main drawers' pulls. 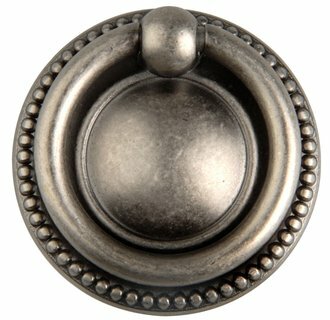 So I have decided to suggest knobs or some other sort of drop knob/pull from the same designer as the 16 other pulls, in the same finish. 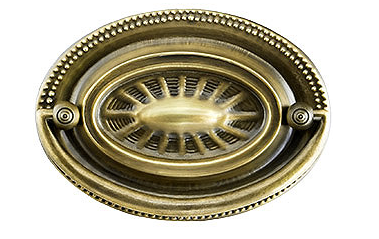 That way you know the two different pulls/knobs will match in color even though they may not exactly match in style. So, what say you? Which combo would you go with of the options above? 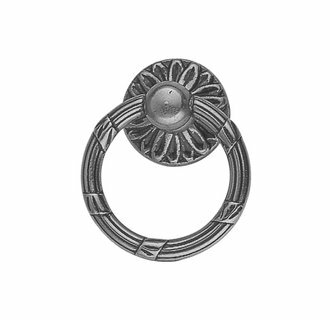 I personally love the third ring pull with the second to last ring knob on the top three drawers. 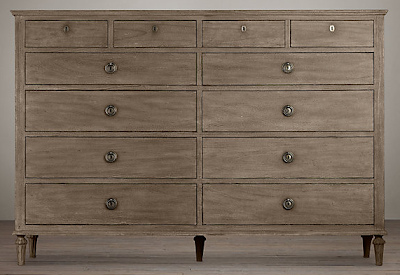 What Restoration Hardware dresser would you have copied? Hi! I saw a listing for the this place on Craigslist but can't find it. Would you share the address??? Thanks! Nice I also share with you something hope this helpful for you Leather furniture has a new found popularity because now it comes in different shapes and colors. Leather is an old favorite, but it now has a new face. There is plenty of good leather furniture in colors and designs that were never seen before in leather. American Leather is one of the leaders in leather furniture, but other manufacturers offer plenty of choices as well.Check it out thanks. I love the unlimited options thatCustom Furniture offers. I have bought a few custom pieces from Mecox Gardens, most recently my dining table. I love their design team. Everything was just beautiful and they created exactly what I had been looking for.